What is the Emotional Wellbeing Hub? 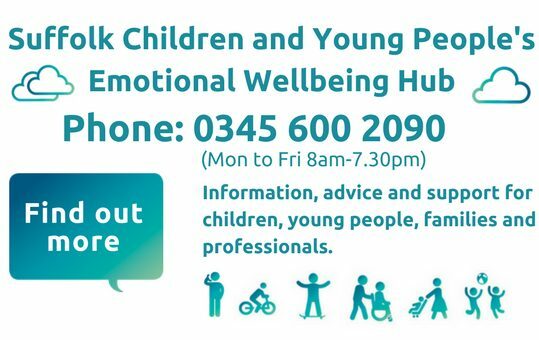 The Emotional Wellbeing Hub provides information, advice, and guidance for those concerned about the emotional wellbeing and mental health of a child or young person up to the age of 25 years, or directly to young people who need emotional wellbeing support in east and west Suffolk. The Source website – The Source website is designed for young people to access information and guidance on issues they may face in their everyday lives. The site includes emotional health and wellbeing advice and support available in Suffolk. School nursing ChatHealth text service – Text 07507 333356 for confidential health advice from a school nurse (available Mon-Fri 9.30am to 4.30pm). Wellbeing Suffolk – Wellbeing Suffolk provides free advice and support across Suffolk for people of all ages on common mental health and emotional issues, such as low mood, depression or stress. Young people over 16 can self-refer. Ask the Expert 4YP – The Ask the 4YP expert live chat is available on Wednesday and Thursday from 5-7pm. The service is now available on the 4YP website. Alternatively you can get in touch by dropping-in to Ipswich 4YP Monday-Friday 10-5pm, giving them a call on 01473 252607 or taking a look at their website for more details on the services and groups they provide. YoungMinds – If you are a parent needing help you can contact the YoungMinds Parent Helpline on 0808 802 5544 (Mon-Fri from 9:30am to 4pm). MindEd for Families – MindEd for Families provides practical and evidenced-based advice and guidance to help you support your child. Parents have worked with mental health practitioners and NHS England to develop the information on their website.